House on Cape Cod 1/10/2012 | Joseph Bergin Architect P.C. 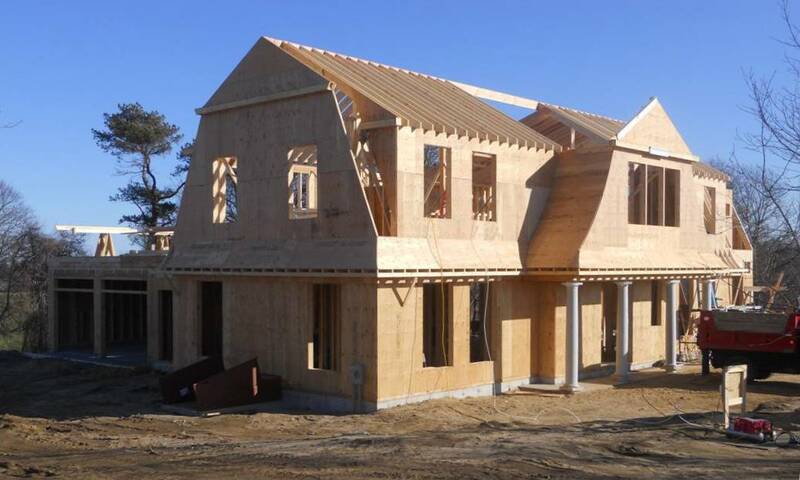 If you are seeing this series of “House on Cape Cod” posts for the first time, today’s post follows two others (and precedes many more) which are memorializing the construction progress on one of our recent projects, a home in Chatham, MA. 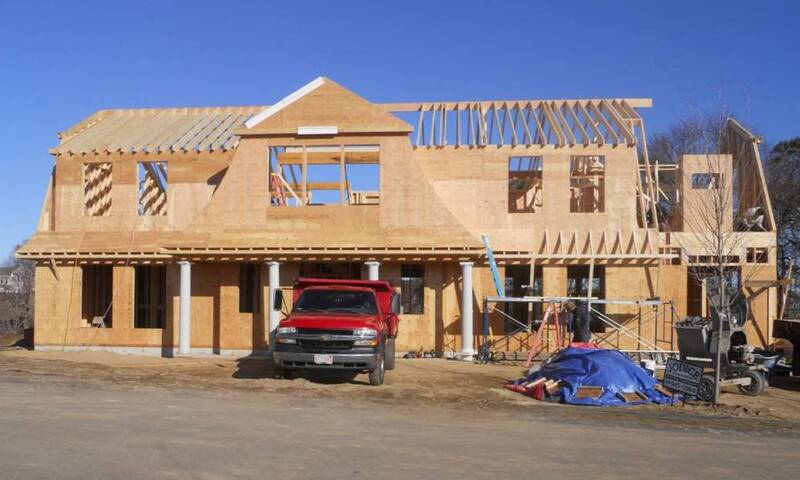 The homeowner visited the site yesterday and snapped these photos, which show good progress in the roughly three weeks since our previous post. 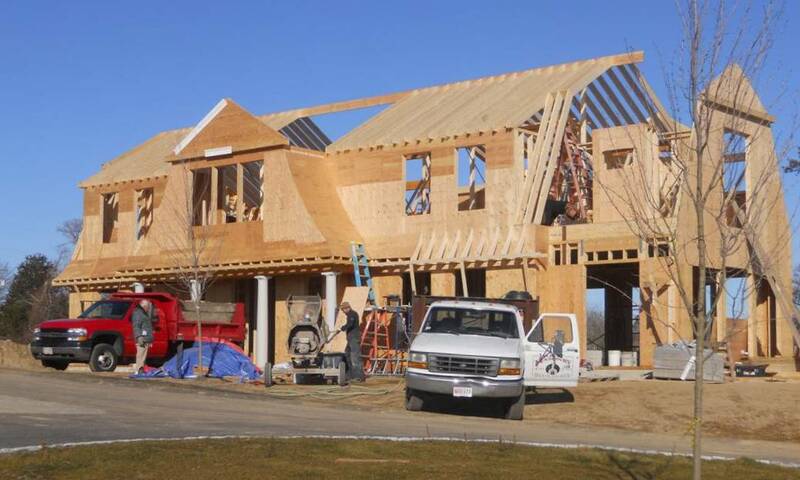 With the gambrel gables framed and the roof planes well established, the form of the roof has taken shape and is marking its silhouette against the sky. While the roofline is marking the sky, the footprint is hugging the ground. Notice that from the ground to the front stoop and then again from the stoop to the door sill there is only a modest rise. Of course, the final grading and the porch paving will ultimately tweak these relationships, but not drastically…the building will, in the end, sit low to the ground. The modest relationship between the grade and the sill is one that I have many times incorporated into projects, and many times it has been discouraged by the builder or his foundation contractor for the extra care it requires in forming and pouring the foundation wall. This time the detail was suggested by the builder and local architect to gain some building height under the zone’s height limitation. Happily, in my opinion, it adds quite a bit more than just height, contributing greatly to the allure of the house. One can imagine the pleasure of passing from the indoors to the outdoors and back in again, enjoying the enhanced connection between the two. This will be especially pleasing in the summer months, when that kind of connection is most welcome!